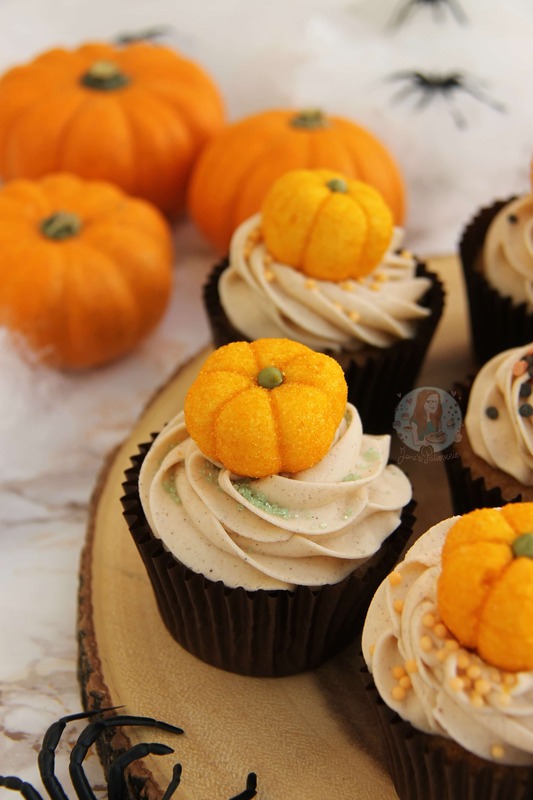 A delicious Cupcake twist on the classic and popular Pumpkin Spice Latte.. Pumpkin Spice Cupcakes with Pumpkin Spice Buttercream Frosting! I adore themed baking. 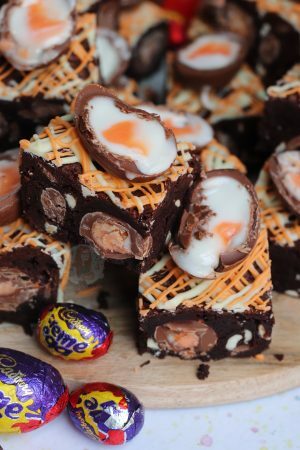 I can’t help but get involved and making something Cute and lovey for Valentines, Chocolatey for Easter, Spooky for Halloween, and Festive for Christmas etc… more and more events keep cropping up throughout the year and I feel like I can’t keep up! Halloween however, I like baking for Halloween SO much. Halloween means you can do things a little different. 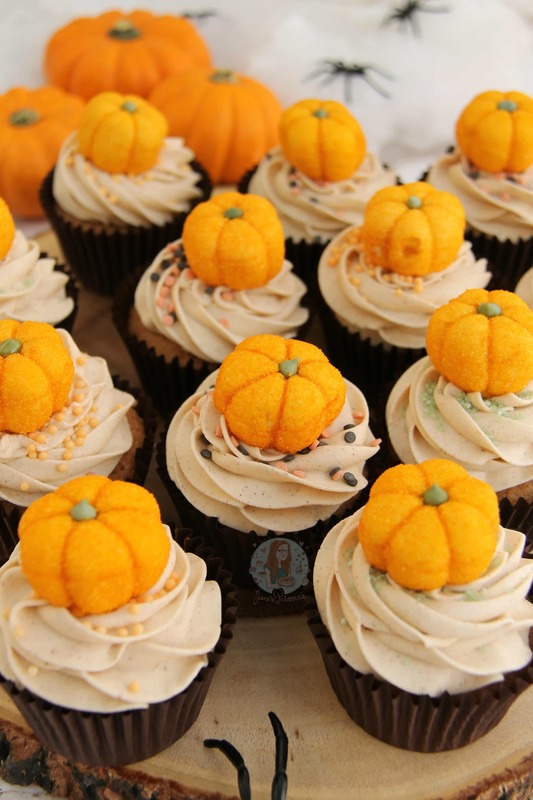 I will admit that I haven’t posted any truly spooky Halloween bakes as I want to make them easy, but I sure have experimented and I am already planning some whoppers for next year! 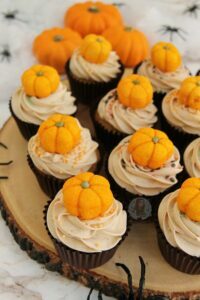 And after the success of my No-Bake Pumpkin Spice Cheesecake last week, I KNEW I had to do another Pumpkin Spice treat. I used a DIY Pumpkin Spice mix from Betty Crocker, which you can find on my No-Bake Pumpkin Spice Cheesecake post. It may not taste exactly like the other pumpkin spice products you can buy, but it tastes damn delicious anyway! One thing I thought I’d do with this Pumpkin Spice recipe in comparison to the Cheesecake is to make it truly ‘PSL’ and use coffee in the bake as well. I decided to use coffee in the sponges as I love coffee flavoured cake more than frosting (personal tastes and all!) and I think it works better in general. I didn’t use coffee in the video for the cupcakes, however, as I had in fact run out… However, feel free to add that in as well! It is entirely optional as some people don’t like coffee. I still wanted the sweetness in comparison to the PS by using vanilla in the sponges and frosting as I find the taste of the PS a little strong and spicey without the hint of sweetness. Again this is a personal thing, but after doing a few taste batches of these cupcakes, the Trusty Taste Testers definitely preferred it with the vanilla! I will admit that when I made this video, however, I was a little rushed, so please do excuse the vanilla spillage halfway through… my bad. 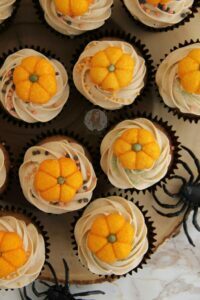 I used simple Brown Muffin cases for these as they seemed to sit well with the colour of the frosting, and they were darker for Halloween, but you can buy some really cute Halloween themed cupcake cases at the minute that they would be ideal as well! 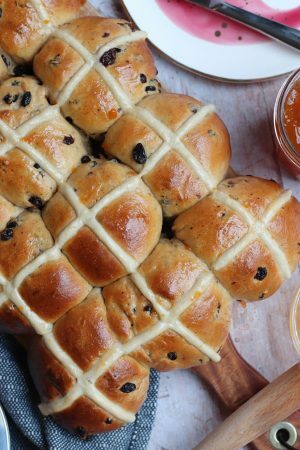 I hope you guys love this recipe as much as I, and my Trusty Taste Testers did… enjoy! 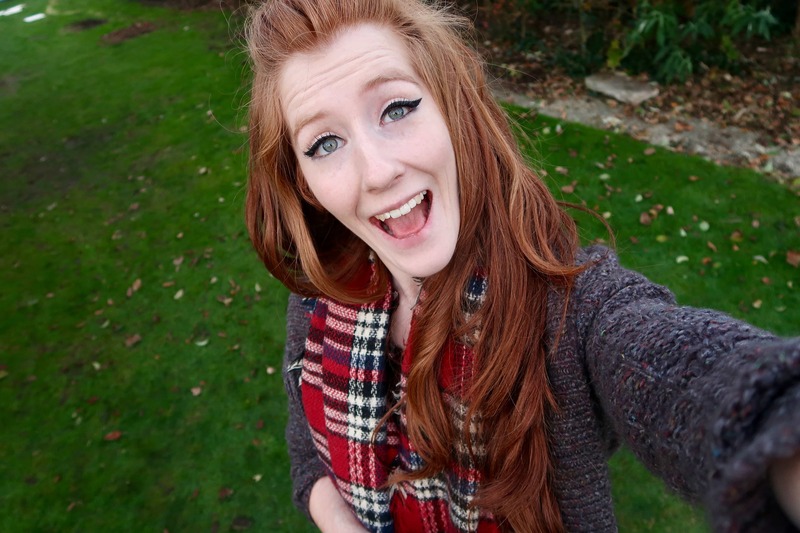 Oh, and I hope you have a spooktacular Halloween! Cream together the Butter and Light Brown Sugar with an electric beater till smooth. Using a cookie scoop, scoop your batter into your Cases and Bake in the oven for 18-20 minutes or until cooked through! Leave to cool on a wire rack. Once the cakes are cool, make the frosting – Beat the softened Butter until smooth – this can take a couple of minutes. Add in the Icing Sugar, Pumpkin Spice, Vanilla and beat fully making sure the sugar is fully incorporated! If it's a little still, add in one tablespoon of boiling water to loosen slightly, 1tbsp at a time. 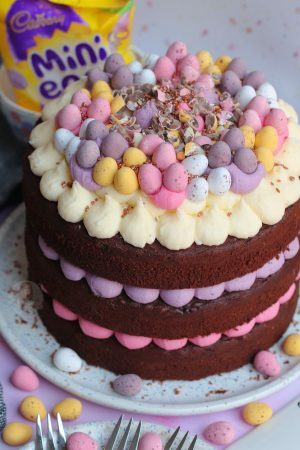 I use my KitchenAid with a paddle attachment for Frostings as the machine can make it so much lighter and fluffier! 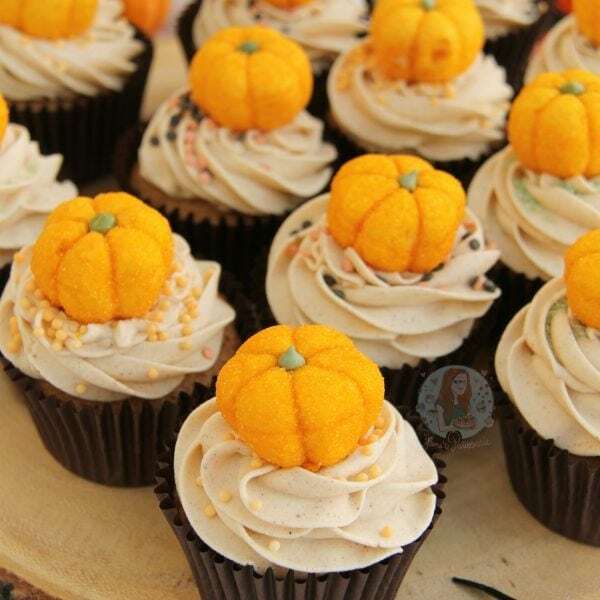 Decorate your cupcakes how you like. I used a Large Star tip, Pumpkin shaped Marshmallows, and some Halloween Sprinkles – ENJOY! 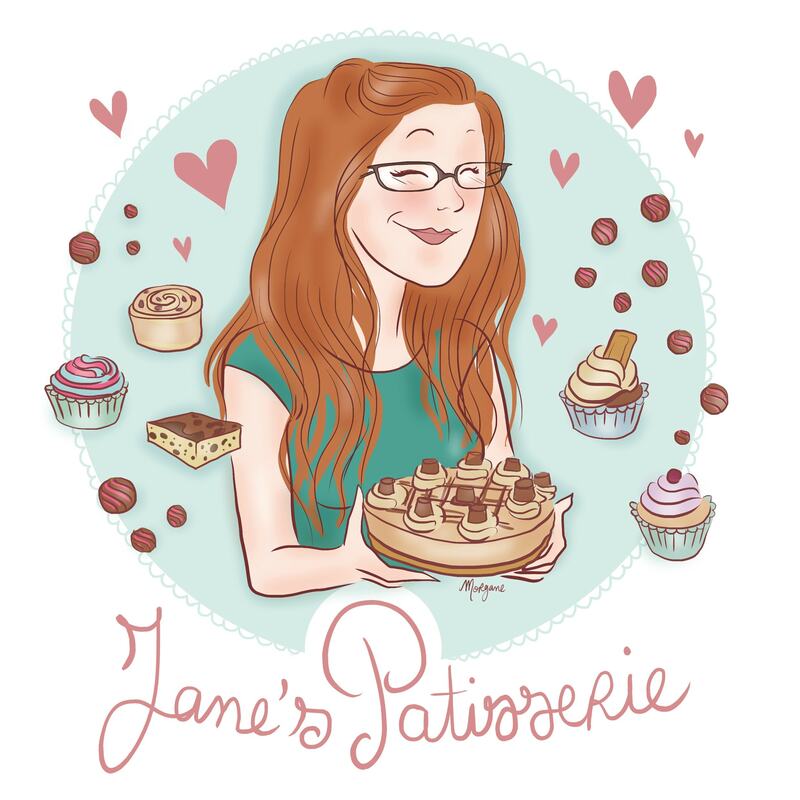 I buy my Cupcake Cases from Iced Jems – HERE! You can use more or less Pumpkin Spice if you wish, but I felt that 1.5 tsps for the sponges and 1/2 tsp for the buttercream was ideal. The mix of the Vanilla as well gives it the sweetness you need! 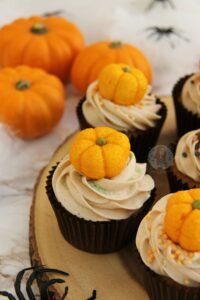 If you want to try real pumpkin cupcakes however, try my Pumpkin Cupcakes! The Pumpkin Spice mix recipe is originally from Betty Crocker and can be found on my No-Bake Pumpkin Spice Cheesecake post! I found these cute little Marshmallow Pumpkins in Asda, as well as the sprinkles! 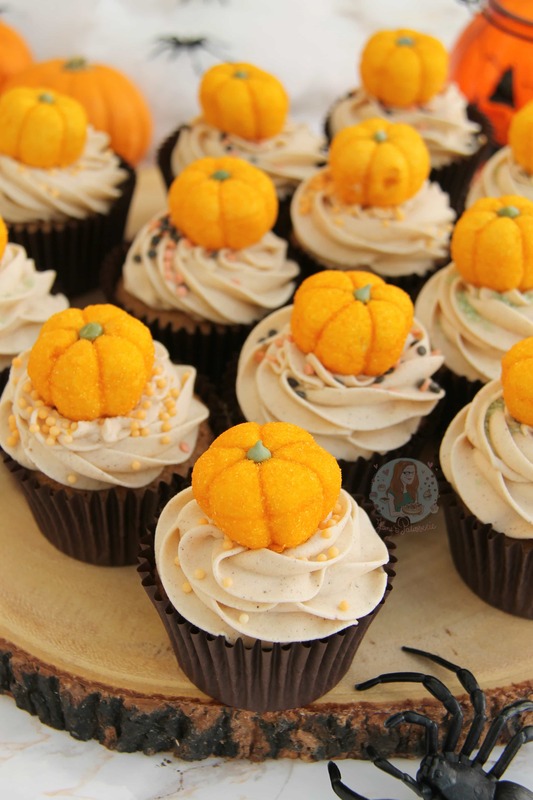 Find my other Cupcake & Halloween Recipes on my Recipes Page! Older Next post: Halloween Drip Cake! Newer Previous post: S’mores Cake!